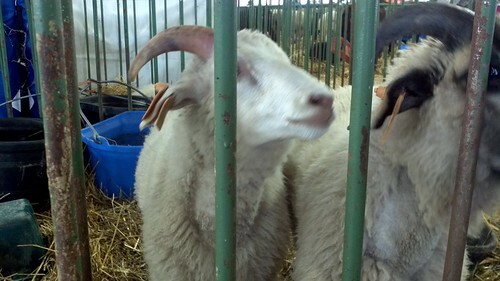 It was another wonderful year at the Michigan Fiber Festival! There were some storms that moved through Saturday afternoon which unfortunately for the poor tent vendors, put a damper on the festivities, and the electricity for some reason was out for about 3 or 4 hours on Sunday all over Allegan, and despite all this we still had a blast. This is such a fun show and I just love the quaint fairgrounds. I showed you some of it last time, with all the big, shade trees and breezes. Even on “hot” days, it is cooler and breezy outside of the buildings. At least it is to us southern girls. The locals think it’s hot if it is 85 degrees, but that’s a cool pleasant day to us. 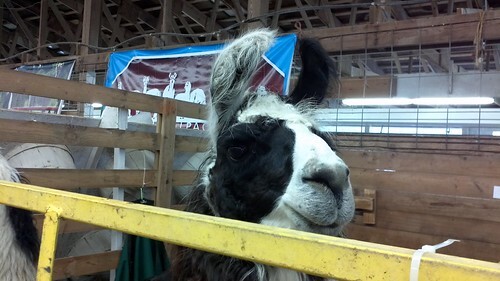 I took a stroll around the animal barns with Gale of Gale’s Art on Sunday morning before the market opened and have some fuzzy critter pictures to share with you. 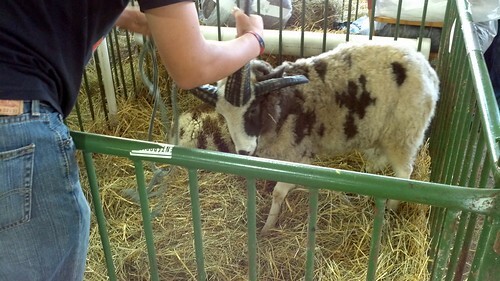 I am pretty sure this is an Icelandic ram. Llama face. I love their big, expressive, brown eyes. Sweet little Finns. So cute! 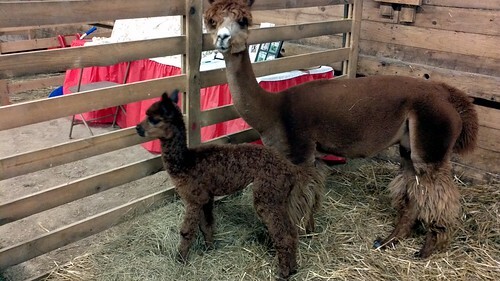 Mama and baby alpacas. Isn’t their color just gorgeous? 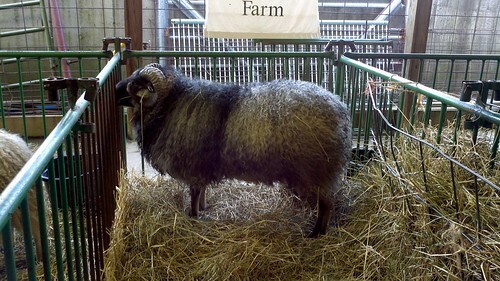 This Icelandic ram is so magnificent I had to get a good one of him. I don’t know what this Jacob ram did to deserve being held by the horns. Seriously, though, that man was putting a lead around him when I was going by. Maybe he had just bought him? 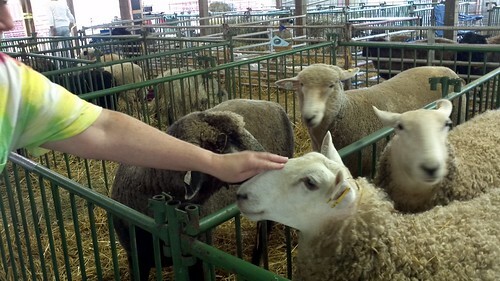 Here’s Gale petting some friendly noses. 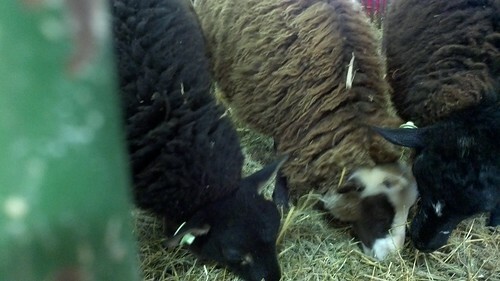 Ahh, and last but not least, are my favorites; the little Shetlands. 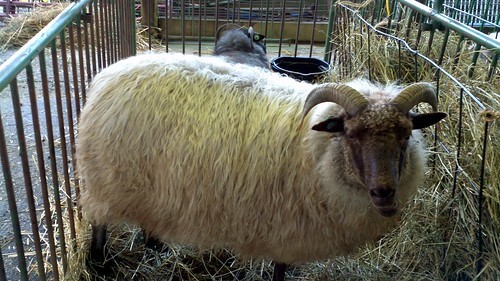 If I were to have sheep, this would be the ones I would have. Love the size and pretty colors. 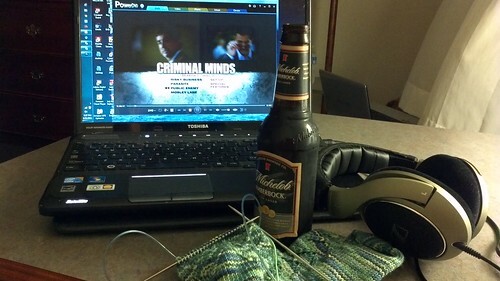 My evening’s entertainment last night which was a well deserved break after a busy weekend. That second sock is coming along and we are finally nearing the end. Only a few more pattern repeats of the cuff and then the ribbing. Okay, the girls are packing up so I need to get on the road. See you in Chicago!